A kayak meet for people interested in Greenlandic paddling techniques and traditional gear? Highly unusual and with very uncertain weather prospects! Nobody had any idea how this was going to go... we took a gamble... and won! 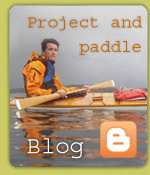 The idea took shape at Njord's sea kayak symposium two years ago. Torleif Holm and I were talking up a storm over a few beers, about how good it could be with a meeting for us who love skin on frame kayaks. Torleif didn't leave it at words, but did something about it by way of the Padleforbundet (Norwegian Canoe Association) discussion forum, and soon there was a workgroup that wanted to arrange a meeting. The conclusion was that the weekend 7.-9. August 2009 might be suitable, and Torleif got a suggestion about StokkÃ¸ya SjÃ¸senter Northwest of Trondheim. 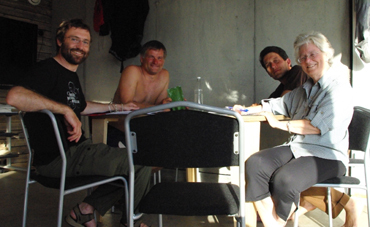 "The festival committee" - or the workgroup, from left to right: Torleif Holm, Asle-HÃ¥vard MiklegÃ¥rd, Anders Thygesen and Jean Midtskogen. Everyone in the group agreed on the framework: a small organized meeting, where people could get together and exchange experiences, learn from one another and have a good time together. It wasn't to be primarily for Greenland kayaks, but for people who were interested in Greenlandic paddling techniques. We hoped this would also make people with fibreglass kayaks who were interested in Greenland paddles feel welcome. The work ended in a program from Thursday to Sunday, with items including rolling training, expedition paddling, rope gymnastics, lectures, movies and slideshows, harpoon throwing, rolling competition, kayak building competition, rolling displays and a lot more. StokkÃ¸ya SjÃ¸senter turned out to be a great site. Modern architecture and fantastic wilderness in beautiful harmony. The SjÃ¸senter is by a small bay, with one of Norway's greatest beaches. There was more than enough space for about 50 kayaks, kayak enthusiasts and regular bathers. GÃ¶ran Posthuma from Sweden tries to throw a harpoon. One advantage of choosing TrÃ¸ndelag as the meeting place was that North and South could meet. It worked fairly well. People came from Northern, Western and Southern Norway, and there were even some Danish, Swedish and American paddlers present. It really was a meeting for everyone. There were experts, and curious hobby paddlers. There were beginners and highly skilled paddlers, who were interested in new branches of paddling as a sport. From USA the world star Dubside also graced us with his presence. 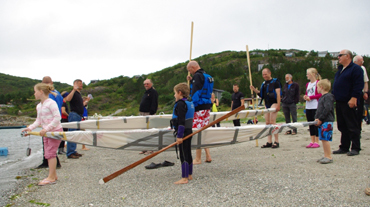 On Thursday there was a rolling course with Dubside and training in the use of the Greenlandic paddle. I was responsible for the latter, and wondered feverishly if I was going to be a fifth wheel next to the celebrity! It went well - beyond my wildest dreams. Dubside taught Eskimo rolls from beginner to expert level, to the satisfaction of all present. My course also turned out to be useful, and people finished the evening tired, but with smiles on their faces. For Dubside's rolling courses, yoga was the obligatory way to start the day. The meetup was supposed to begin on Friday, but there were a number of people already present by Wednesday, and on Thursday I had the impression that the meetup had already begun. More people arrived on Friday. In the end we counted about 50 paying participants. The beach was full of kayaks. Not just skin on frame, but a lot of fibreglass too. There weren't many European oars to be seen, though, which was part of the point. Ropes for rope gymnastics were strung up on the beach, and Dubside continued giving rolling training to several groups. The mood was relaxed. People enjoyed one another's company, went out on the water, and practiced techniques. The weather was fantastic. The sun shone from a cloudless sky, and the sun lotion had to be broken out. The remaining participants in the course of Friday, and there was grilling and expedition paddling for those who were interested. In the evening the meetup was officially opened in a meeting room at the SjÃ¸senter. After this Karl Annar Markussen from Harstad showed photos, and related his experiences during the Greenland kayak championships in Nuuk in 2004. 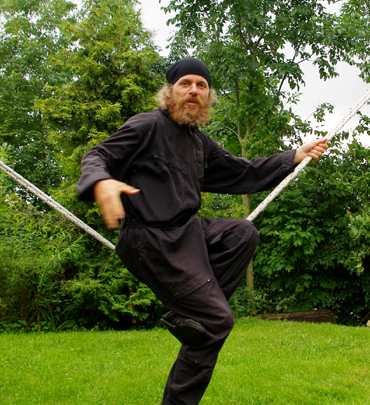 More of the same on Saturday - rope gymnastics, harpoon throwing, technical exercises and rolling courses. A large group went spelunking in a spectacular cave nearby, while others participated in or watched the rolling courses. Dubside was the judge, and all the participants scored unusually high marks according to the master. The weather was again good enough for shorts and sun lotion, and the day concluded with communal dinner - redfish a la StokkÃ¸ya - at the SjÃ¸senter's excellent gourmet restaurant. After dinner there was a lecture about Inuits and paddling by Asle HÃ¥vard MiklegÃ¥rd. Here's the beach as it looked during the weekend. 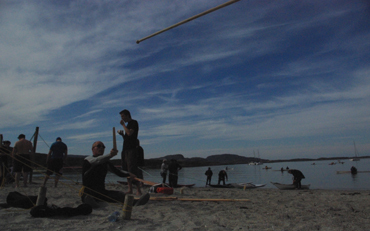 Rope gymnastics, rope gymnastics, paddling, kayak testing, and dry training for harpoon throwing, all in harmonious union. On Sunday there was less planned. There were a few rolling courses, and then a kayak building competition. This activity triggered the passion of a lot of people. The kayaks were built from wood and plastic in an hour, according to original Arctic principles. Afterwards there was a relay race, which ended with rolling the craft! As an end to the day, and the meetup, Dubside arranged a rolling demonstration with help from PÃ¥l Gustad and Ann Kristin Skinnlo. There was no lack of imagination or skill here - very inspirational! Three wood-and-plastic kayaks, built in an hour, ready for their maiden journey and the relay race. Asle-HÃ¥vard keeps track of the rules. After this a lot of people began to pack up and go home - full and happy after a fantastic weekend. Everyone I spoke with was all smile and praise, and hoped the success would be repeated next year. The committee has already discussed the possibility, so if you think this sounds exciting, the chances of a repeat are fairly good!